„Not valid for Germany“ in Hebrew and French language. Israeli passports began to be issued in 1948, after the Israeli Declaration of Independence on May 14, 1948, and used Hebrew and French texts. At first they were not defined as a passport but as a Laissez-passer (definition: a document allowing the holder to pass; a permit), this changed in 1952 when Israel began to introduce the first travel document as a passport, they began to be issued late that year. The first Laissez-passer was issued to Golda Meir, who at the time worked for the Jewish Agency and was soon to become Israel’s ambassador to the USSR. 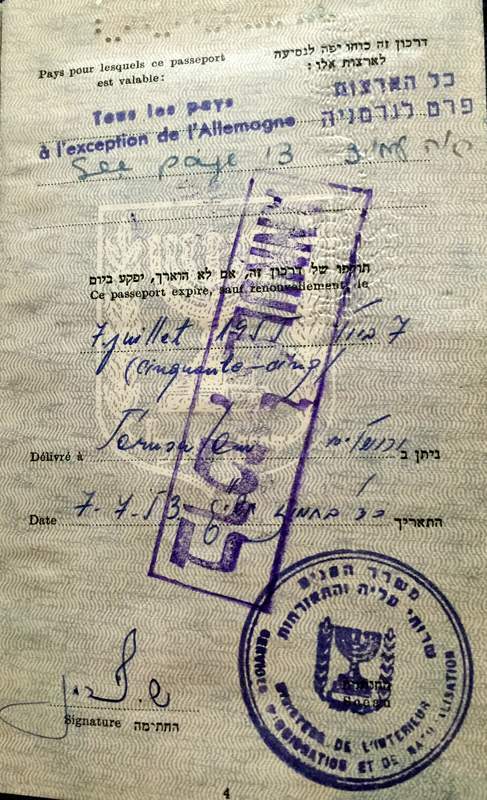 The first Israeli passports bore the limitation: “Valid to any country except Germany”. An Israeli citizen who wished to visit Germany had to ask that the words “except Germany” be deleted from their passport. This was done manually by drawing a line through these words. 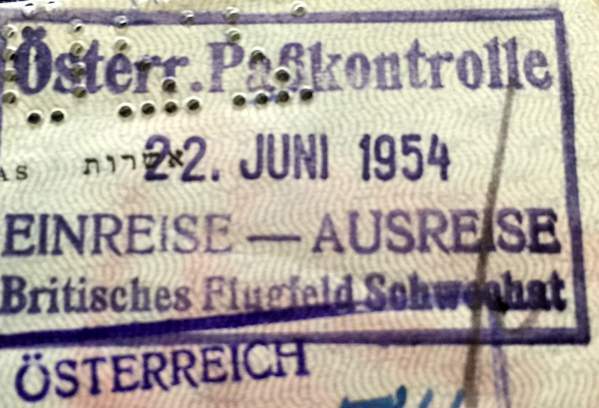 After the signing of the Reparations Agreement between Israel and West Germany in 1952, the limitation was withdrawn and passports became “valid to all countries”. On 30 March 1980, new regulations issued by the Minister of the Interior required Israeli passports to use Hebrew and English, instead of Hebrew and French. Subsequently, French texts were replaced by English texts. The shown document was issued on 7 July 1953 and it’s even more surprising that this stamp was still there after above given statement. The passport number is 22033 – truly an early issue considering that travel documents as passports were issued just in 1952. Silberstein’s passport got an extension from the Israeli embassy in London in Sep 1953 which allows him to travel to Germany. You can also see the visa for Germany issued in London on 4 Oct 1953. There is also a stamp “Leafleat supplied”. I wonder how that was look like? Another interesting stamp in the passport is from the British airfield Schwechat which became Vienna airport in 1954. There were two other British airfields – Schönbrunn and Küniglberg. Both became obsolete after the British occupation in 1955. 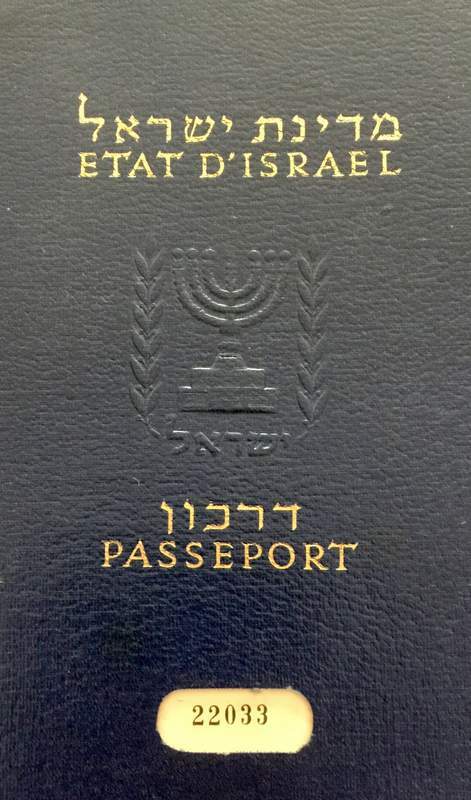 There were Israeli Diplomatic passports before 1952 as I once had one issued to Ehud Avriel who was a Knesset member. I swapped the document with an Israeli fellow collector against a German collectible as this is my core collection focus.